Time Optics is proud to be the first to combine technology and fashion, to create our Amazing Fashionable Talking Gold tone Pendant Watch. (Special IPG Plating that keeps your watch looking new!). Using our own UNIQUE Talking DUAL VOICE (switches voices to either male or female with the push of a button), Chip, our talking pendant not only tells you the time, month, day, date and year, but it has an added Alarm Feature. 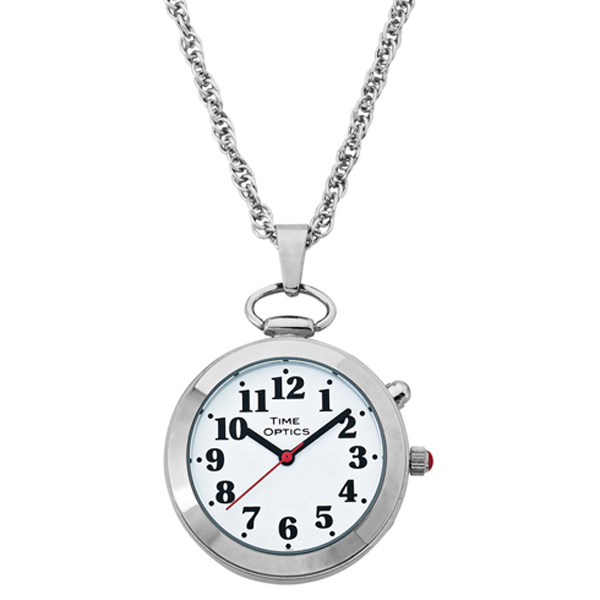 Our Talking Pendant watch features a beautiful shiny silver tone case, with both a bale (so the pendant lays flat) and 30 inch chain, which fits over most heads for easy on and off. It is also long enough to lift up and see the time with the bold numbers on a clean white dial. Our watch also features a Fashionable Pumpkin Crown with a beautiful cabochon accessory. It also aids those with Macular Degeneration and other eye issues. This is just the perfect size pendant and chain to make a beautiful fashion statement.